Merritt Island National Wildlife Refuge is located due east of Titusville on Merritt Island in Brevard County, Florida, and occupies 140,000 acres, with the Kennedy Space Center. The refuge traces its beginnings to the development of the nation’s Space Program. In 1962, NASA acquired the 140,000 acres of land, water, and marshes adjacent to Cape Canaveral to establish the John F. Kennedy Space Center. NASA built a launch complex and other space-related facilities, but development of most of the area was not necessary. In1963 the U.S. 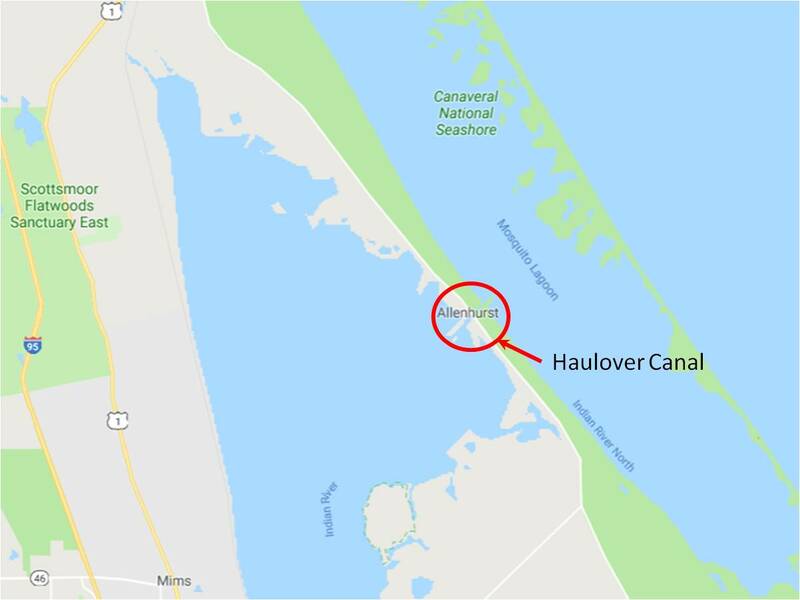 Fish and Wildlife Service signed an agreement to establish the refuge and in 1975 a second agreement established Canaveral National Seashore. Today, the Department of Interior manages most of the unused portions of the Kennedy Space Center as a National Wildlife Refuge and National Seashore. On Wednesday before Thanksgiving we drove to Haulover Canal. This is the spot where the Intra-Coastal Waterway (ICW) crosses from the Atlantic Ocean into the Indian River. We launched our kayaks at the boat launch near the drawbridge on State Road 3. The boat launch basin had pods of manatee and dolphins. They were all over the place! After we spent quite awhile watching and taking pictures of them we started to paddle towards Mosquito Lagoon. The tide was coming in and we paddled against its strong current. We saw several boats transiting the canal as a part of the ICW, it was fun to imagine living fulltime on one of these boats instead of our RV. There were birds everywhere. We paddled right under some osprey resting in the trees above the canal. We saw blue heron fly from the shore and rest up in the trees. We had never seen them rest in trees like that as they are more of a wading bird. At the mouth of the canal we saw a flock of pelicans diving for fish. They are comical to watch. They fly gracefully above the water then dive in what looks like a controlled crash into the water. After a short stop on the canal bank for a quick snack we headed back to the boat launch. It was definitely a faster and easier trip back with the rising tide pushing us. Back in the boat launch basin the manatee and dolphins were waiting for us. While we were being careful and trying to stay away from the sleeping manatee, once in awhile one would swim right up to us and dive under our kayaks, just a little thrill. It was a long drive from the campground to the Wildlife Refuge, but worth every mile of it. It’s almost ironic that this wildlife refuge is a result of the development of the Kennedy Space Center. Space Age technology is supporting the preservation of nature and protecting the environment. 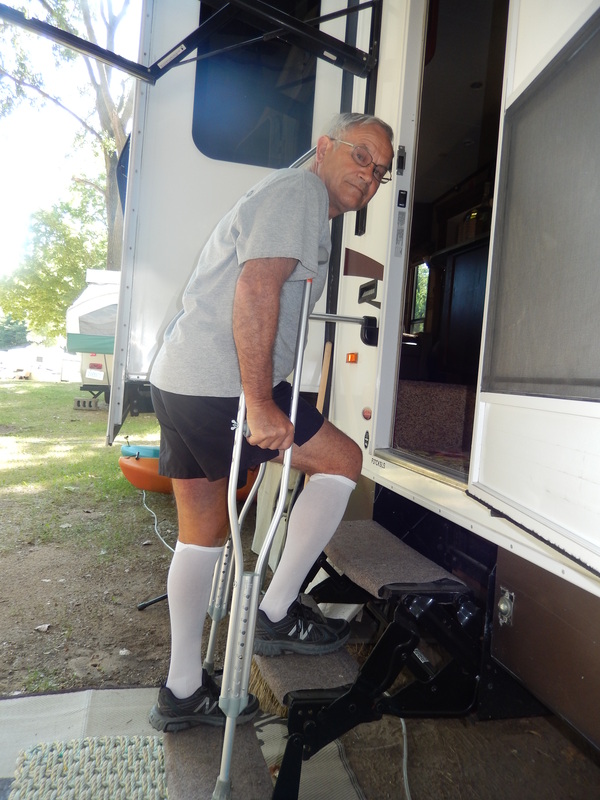 One of the concerns that have been expressed by many full-time RVers in their blogs and on Facebook is medical treatment. That is one of the reasons that I wanted to write this post. Also many of my friends have or may face the same problem that I did and this is for them as well. For many years my knees had been bothering me. 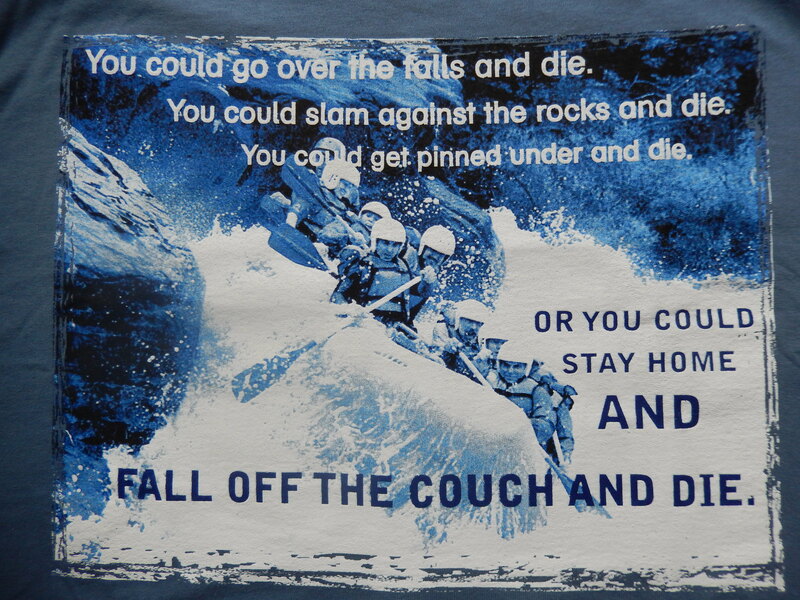 I attributed this to my ninety-nine military parachute jumps and hundreds of miles of running. I tried treating myself with ice and exercise without success before I saw an orthopedist, Dr. Steven Drayer. 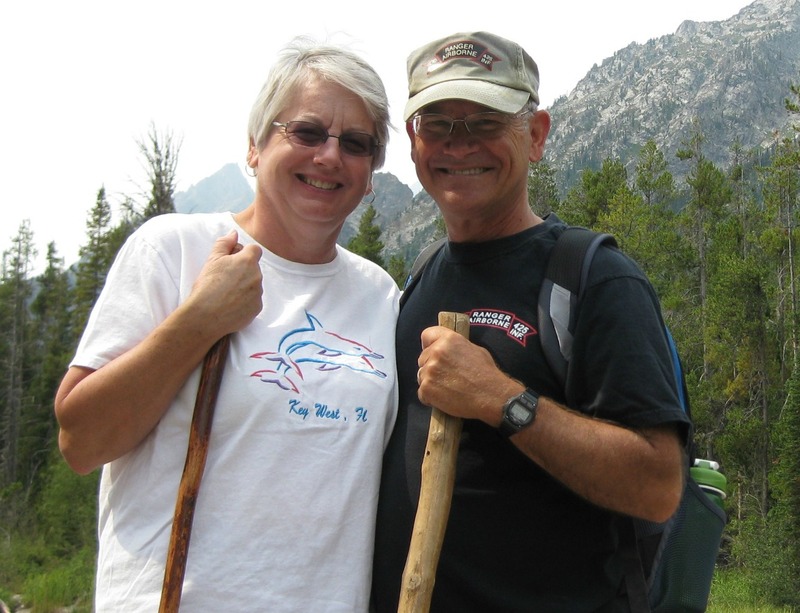 Dr. Drayer had successfully repaired my wife’s broken ankle years ago and has performed thousands of joint replacements. He advised me that I had worn out the cartilage in my knees and had bone on bone impact in some areas. He treated me with shots to cushion the knees and advised me that I was a prime candidate for partial knee replacement surgery. For the next few years I stopped running and started walking. The shots helped a lot, but I was still experiencing aching pain and it was certainly taking a toll on my quality of life. Finally, last fall Dr. Drayer said he wasn’t going to give me shots for the rest of my life and we needed an end game. I decided to go with the surgery and we tentatively planned to do it this summer (2018). If you look close at these before the surgery x-rays, you can see the bone on bone contact. Pat and I determined we had to be in one spot for about three months so I wouldn’t have the physical stress of packing, hitching up, and moving. We made arraignments for a three month reservation at the Lansing Cottonwood Campground. Cottonwood is a nice RV park and a convenient 15-20 minute drive to the hospital and Dr. Drayer’s office. 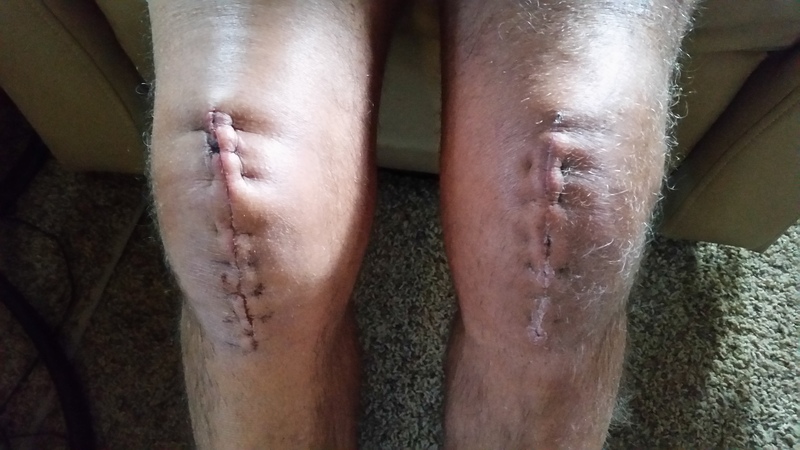 I was presented with many options, but chose to have both knees done, two weeks apart. 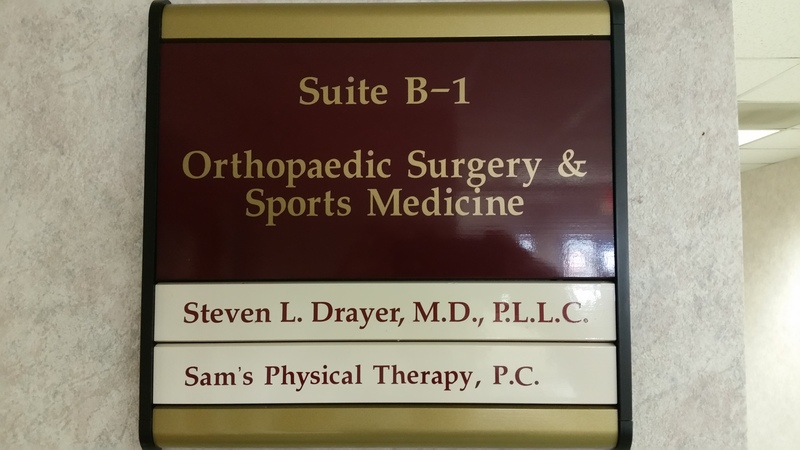 I had originally planned to have them done one month apart, but Dr. Drayer was having surgery done on his shoulder and would not be available until July. When I asked about a two week interval, Dr. Drayer said it depended on how well I could tolerate pain. 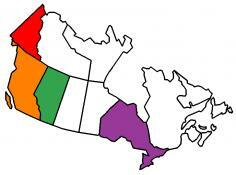 Given that we wanted to be heading south by early fall, I opted for the shortest possible interval of two weeks. Dr. Drayer uses MAKO Robotic-assisted Surgery and is one of the pioneers in this method. He told us that it results in less trauma and blood loss, and a shorter healing time. In preparation for the surgery I had to have CT scans of both knees, and an exam by my primary care doctor to clear me for the procedure. Other preparations included stopping some of my normal medications and starting new ones, and washing with an antibacterial soap for five days. For both surgeries we arrived at Sparrow Hospital in Lansing at 5:00 in the morning. After I was prepped and met with the Anesthesiologist and Dr. Drayer I don’t remember much as I was sedated through the whole procedure. On the first operation (the left knee) he removed the diseased bone from my femur and replaced it with titanium and replaced the underside of the kneecap with titanium. 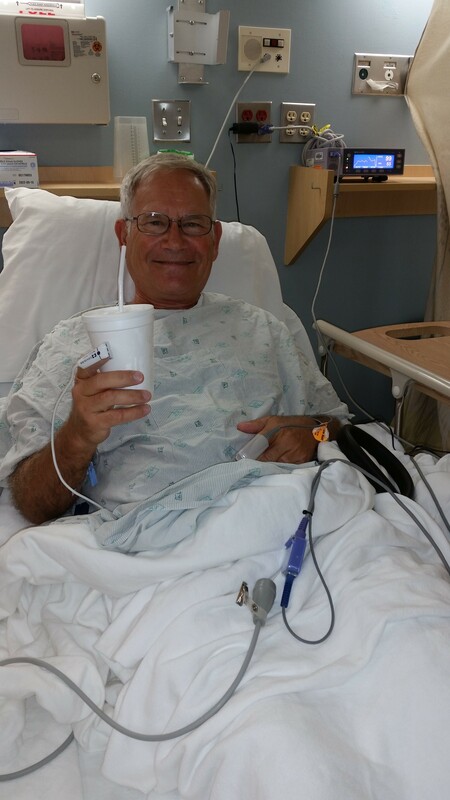 Two weeks later he only had to replace the underside of the kneecap, as he determined that there was plenty of good bone and cartilage remaining on the right knee to make any additional repair there unnecessary. Everyone talked about using a walker, but no one said it was a requirement. I opted not to get a walker, but to use crutches that I already had. This turned out to be a good decision as the close quarters of the inside of our trailer would have made a walker impractical. It was easy to get around with the crutches and I never regretted that decision. 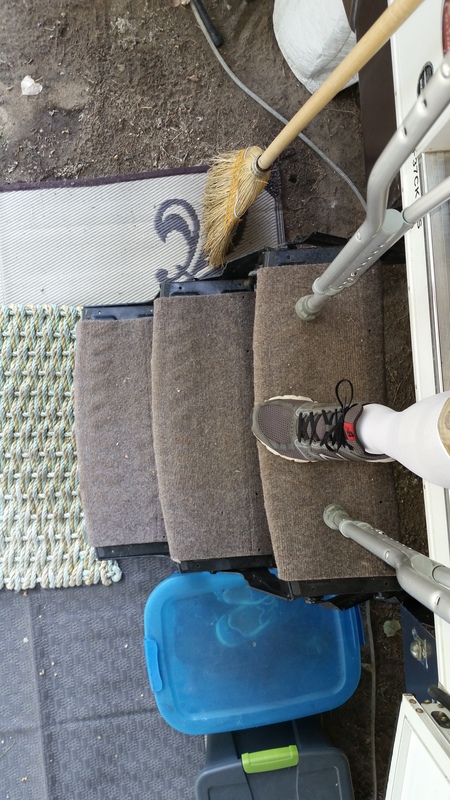 Getting back from the hospital was an experience, climbing in and out of our pick up truck was quite the effort, especially after the second surgery with my left knee not fully recovered but still the stronger of the two. Also getting into the trailer was an effort. It takes five steps with a nine-inch rise to get inside. Fortunately I had used crutches before and knew the drill, but it was still an effort. However if you look at almost any house with a porch, it would have been almost the same situation. The surgery was the easy part; after all, I slept through that. Now the hard part began – the rehabilitation. The skeletal part of my knees was better than it was before, but the trauma from the surgical procedure was painful. After all Dr. Drayer had cut open my knees to the bone with a six inch long incision, sawed away part of the bone, fastened pieces of titanium, and stitched it all back up again. I was prescribed a narcotic (Percocet on the first operation and Norco on the second) as well as prescription level (600mg) Ibuprofen to help me handle the pain. Pat was initially concerned of the possibility of addiction until a nurse told us that as long as there is pain, the pleasure part of the brain does not respond to the narcotic (That’s my layman’s explanation anyway). For the first several days, Pat took charge of my medication until we had a system in place. I had met with my physical therapist, Sam, before the surgery and he had laid out a series of exercises to begin the day of surgery. You don’t want to wait on these exercises, the sooner you start and the more dedicated you are, the better your recovery. I know people who had undergone knee surgery and had heard good news and bad news. From their stories I determined that the best outcome was a combination of a good surgeon and dedicated physical therapy. I felt Dr. Drayer was the best surgeon I could find, I trusted him, and I was determined to be the best patient Sam had ever had. The physical therapy exercises were simple, but tough. I knew I had to push myself and I did, I felt pain in almost every exercise I did. I was concerned how much I should push myself, and I talked to Sam about it. He encouraged me to push myself as much as I felt I could and I would know if it was too much. I knew rehab would be tough, but I didn’t realize how much time I would have to commit to it. Here’s the deal – the exercises take about an hour. After the exercise I’m suppose to ice the knee with the Iceman machine I got from the hospital for an hour. Every two hours I’m suppose to walk, then ice for another hour. So let’s say I start exercising at 8:00 in the morning, I’m icing by 9:00, then walk at 10:00, and ice again. This cycle then repeats all day long. I never realized that rehab would be a fulltime job! A week after the surgery I had my first appointment with Sam. I think Sam is a great therapist, but I also think most therapists are masochists at heart. Every time I met with Sam he gave me a workout, and I gave as good as I got. One of the slogans in the Infantry is “Pain is weakness leaving the body.” Also a line from the Ranger Creed is, “Quit is not a Ranger word.” With these lines repeating themselves in my mind I attacked the exercises, making sure I was doing them properly and completing or exceeding the number of repetitions Sam wanted. I paid close attention to what Sam did in our sessions and modified my own workouts to get the same effect. Oh, I had my share of low morale. After the second surgery I was trying to do the straight leg raise and, no matter how hard I tried, I didn’t have the strength to lift the leg. I had to put my exercise strap around my foot and lift the right leg with my left foot. As the days went by I no longer had to lift with my left foot, and a few days later the strap became unnecessary – Quit is not a Ranger word. My walking went from 15 minutes of walking around the inside of our trailer to one and then two laps around our loop in the campground. A week after the second surgery Sam told me to only use one crutch instead of two. A couple of weeks later I began using one of my trekking poles as a cane. 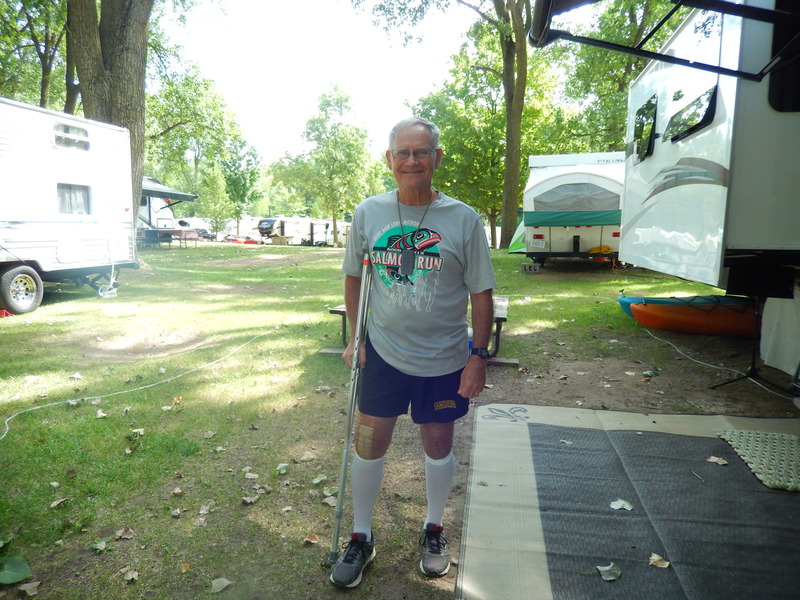 Finally, at six weeks after the first surgery I only used the cane when I went walking on the uneven gravel road of the campground, and did without it the rest of the time. I celebrated our anniversary on August 25th by putting the cane away and going without it. During this same week, Sam and I agreed to reduce our therapy sessions from three per week to two. Seven weeks after the first surgery I was able to walk two and a half miles. Like I said you have to push yourself. Dr. Drayer had told me about a patient that, eight weeks after surgery, was off her pain medication and performing at about 80 – 90%. Because of that I focused on eight weeks of therapy, but as time went on I began to view the eight weeks as a minimum. That seemed to be more realistic. Over Labor Day weekend I felt I turned a big corner. I started doing the step up exercise on a twelve inch stool instead of on a seven inch rise step and used the stool for what Sam called a walk through exercise. That definitely ramped up the effort. I did a two and a half mile walk on Sunday that felt great, very little pain in my knees (Yes, I was still taking Ibuprofen but you can tell the difference.). Oops! The next week, while doing one of my exercises I may have strained a muscle and it hurt-bad! Of course I continued to push through and the pain just got worse. I started limping and that got me concerned. When I saw Sam for my appointment on Monday he told me that I needed to rest and put ice on it. I continued to exercise while applying ice when I was done, but the pain wasn’t going away. When I saw Sam on Thursday he said I don’t seem to do well with “R words” like Relax and Rest. This time I took his advice and backed off on the exercise, just doing a few stretches and using weights on the other knee. After three days I was already seeing an improvement. I guess the lesson here is you need to push yourself, but you also need to back off when necessary. Trust your therapist and follow their instructions. 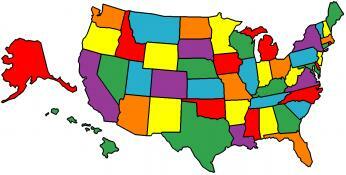 I met with Sam for our final session on September 18th and he certified that I no longer needed formal therapy. By the way, this was exactly eight weeks after the second surgery; I guess I was right on schedule! 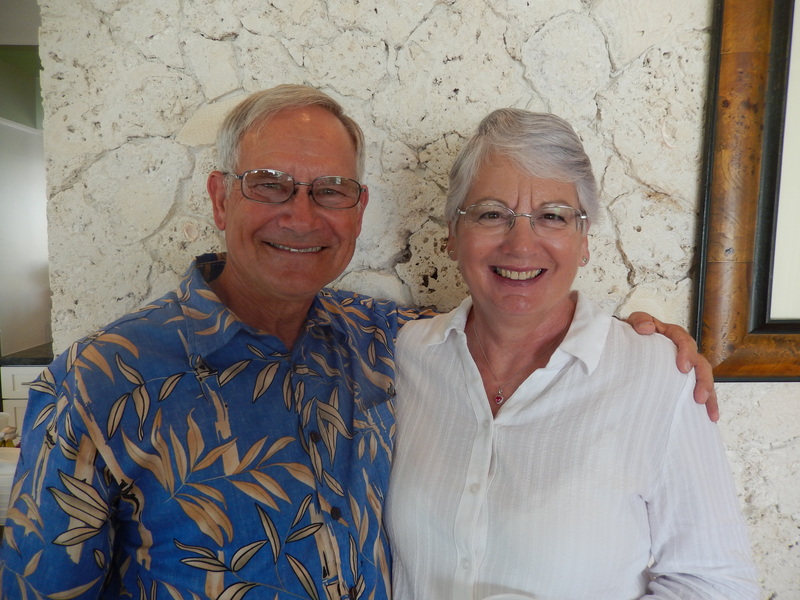 Later that week I met with Dr. Drayer on Friday for our final checkup. He was very pleased with our results and had positive comments on the range of motion I had achieved. I asked him about resuming activities like running. He said I could do anything I wanted, but cautioned that there could be some negative consequences. He said that if I resumed a serious running schedule that the titanium attachments could become lose and another operation would be needed to correct that. His advice was to stick to walking, or running on a treadmill as it provided more cushioning, but would not recommend running on a sidewalk or trail. I still had some pain, and Sam and I discussed what exercises I should continue. Both Dr Drayer and Sam suggested that it could be months before all the pain is gone. It’s now almost four months since the second surgery and things are still improving. I continue to exercise for strength and flexibility, and ice my knees after each workout. The good news is that I can go for ten mile bike rides and four plus mile walks, and I plan to build on that. There is still some pain and stiffness but it is less every week. Yeah, I get discouraged, I wish this pain and stiffness would just disappear one day. I am not known for my patience. However, I passed the point of no return the day I showed up for the first surgery, so I continue – Quit is not a Ranger word. Was it all worth it? I think so. Before the surgery I knew that the pain would only get worse in the future. Now I can feel the improvement and it should get better. So, thank you Dr. Drayer, Sam, and the best nurse I ever had, my wife, Pat. We stopped in Lexington, KY mainly to see an old friend of mine from my National Guard days. 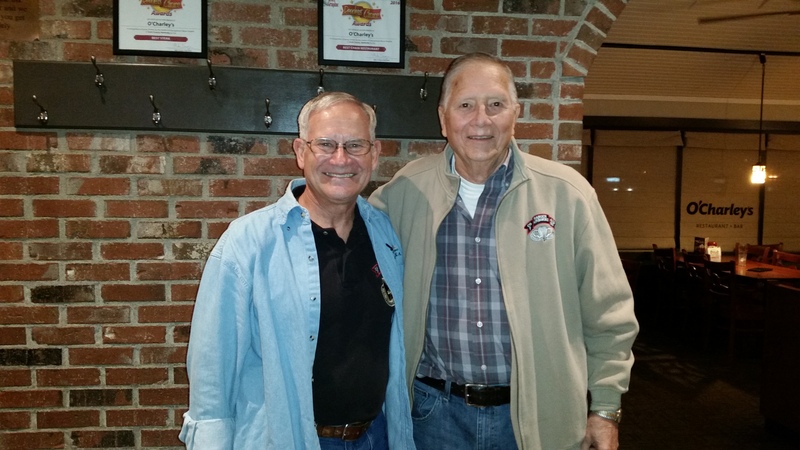 Bill Weber was my Operations Sergeant when I was the Operations Officer for Company F (RANGER) 425th Infantry. Bill had lived in Michigan, but moved to Kentucky for his job. Living in Kentucky didn’t stop him from serving in our unit. Every month he would drive to Michigan on Friday and then drive back on Sunday. Talk about dedication! I always considered Bill to be a special friend and it was great to have dinner with him and his wife. 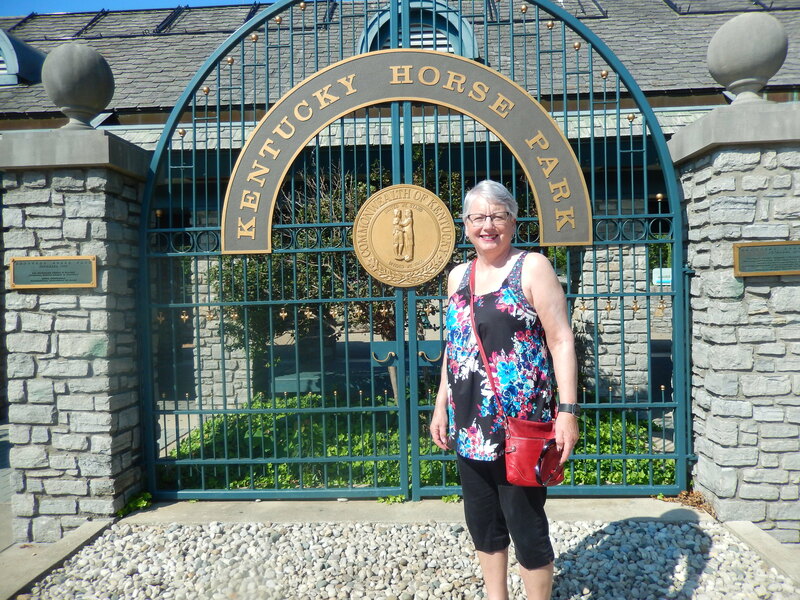 We decided to stay at the Kentucky Horse Park Campground for two nights to break up the trip and, on the spur of the moment, decided to visit the Horse Park. We were delighted to discover that the Kentucky Horse Park gives serving military members and veterans a 50% discount on admission. We began our tour at the International Museum of the Horse, a Smithsonian Affiliate. The museum is the largest and most comprehensive museum in the world dedicated to exploring the history of all horses and their impact on human civilization. Through its ever-growing library and archives, it also serves as a resource for scholars and researchers throughout the world. I was very interested to see the roles in which horses were used over the centuries. Partway through our tour of the museum we left to see the Hall of Champions. Champion horses that have finished their careers have been acquired by the Horse Park and stabled on the grounds. Thoroughbred legends Da Hoss, Funny Cide, and Go for Gin, as well as American Quarter Horse Be A Bono, Standardbred Trotter Mr. Muscleman, and Standardbred Pacers Staying Together, Western Dreamer, and Won The West are shown in daily presentations. We were able to see them in their stalls and then they were presented to the group in a viewing arena where we learned about their race history and, in some cases, their studding history. These horses were absolutely amazing, talk about thoroughbreds! After this Pat went to watch the Parade of Breeds and I returned to the museum. With music, narration and interaction, humankind’s six thousand year partnership with the horse is brought to life in the Parade of Breeds. From the rare Marwari to the iconic American Quarter Horse, breed representatives perform in hand and under saddle. During the summer season, breed representatives perform in colorful attire that evokes the culture, time period, and customs of their native land. At the museum one of the most intriguing exhibits was the one on the Arabian Horse. I was fascinated by how the Arabian evolved to perform in a desert environment. However, what impressed me the most was that Arabians are used to breed other horses, but no other horses are used to breed Arabians in order to keep the breed pure. 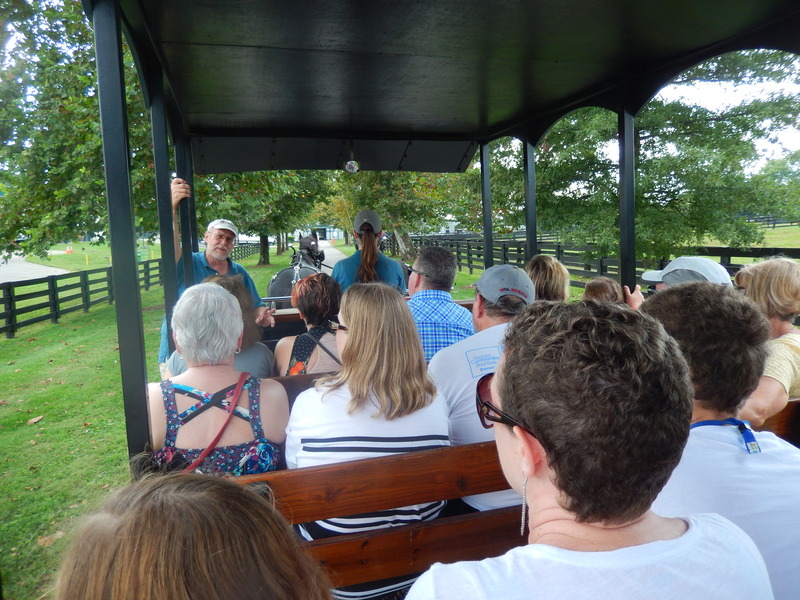 We took a brief horse-drawn trolley tour that showed us even more of the park and we learned about the variety of shows that take place every Wednesday through Sunday. On our way out we visited the memorial of Man o’ War, probably the most famous race horse in history. On June 6, 1919, ridden by Johnny Loftus, Man o’ War won his first race by six lengths, crossing the finish line at a canter. He showed his desire to be a front runner and never liked to have any other horse in front of him. Legend has it that upon seeing him in action, a spectator asked a groom, “Who’s he by?” The reply was “He’s by hisself, and there ain’t nobody gonna get near him.” He ran only in expensive stake races for the remainder of his career. His sixth race was the Sanford Memorial and the only defeat of his career. A bad start left him with a ten length deficit and, once he caught the pack, he was boxed in. He was beaten by a horse ironically named Upset, whom Man o’ War beat on six other occasions. In spite of this lone defeat, at the end of his two-year-old season he was selected Horse of the Year. 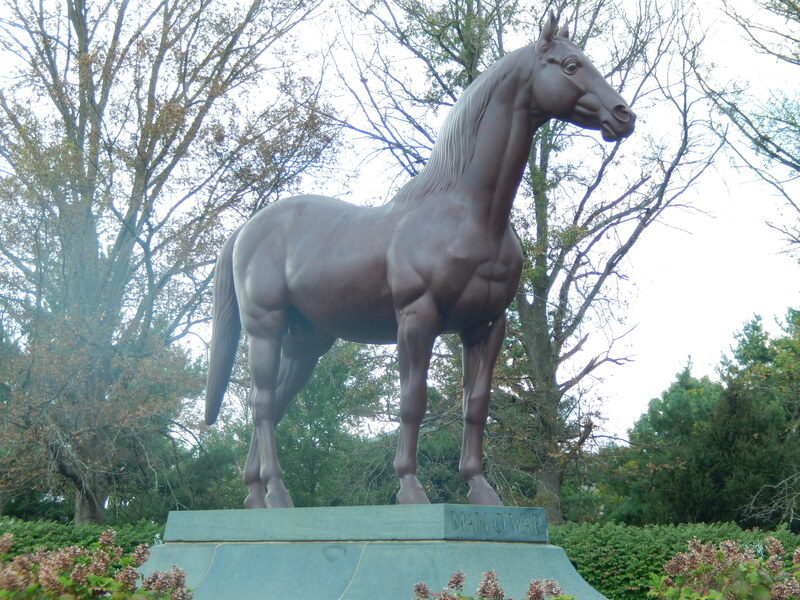 Not only did he win 20 of the 21 races he ran, but he sired a string of horses that went on to be champions themselves, such as War Admiral, a Triple Crown winner who is also buried in the memorial. 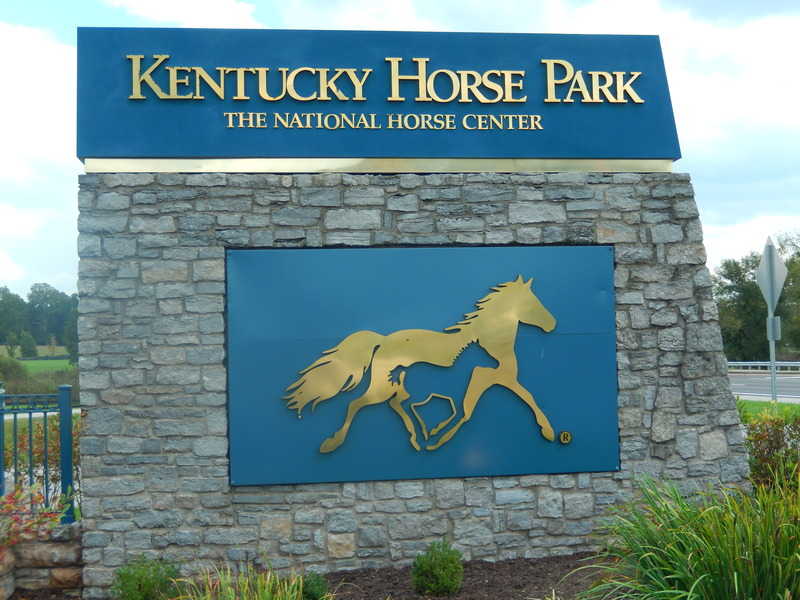 There are many great things to see in Lexington, KY, don’t forget to include the Kentucky Horse Park in your plans. The Great Lakes Naval Station, north of Chicago, IL is the only place the Navy trains its recruits. I always thought this might be a good place to stay and we were fortunate enough to get a reservation over Memorial Day weekend. In addition to training new recruits the Navy also offers training in specific skills, such as electronics, naval gunnery, communications, gas turbine systems, and damage control, to name a few. 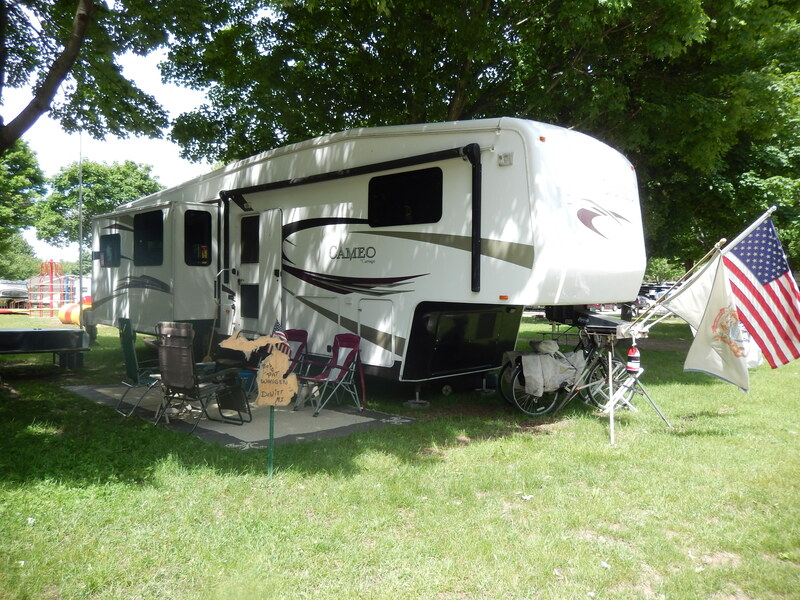 The RV park is small, but is a great location for families to stay while visiting their sailors. The park only offers electric hook ups, campers have to fill their fresh water tanks and dump their waste at the marina, about a mile away. The sites are pretty tight, but the view of Lake Michigan makes up for all of these shortfalls. The Naval Recruit Training Center conducts a graduation every Friday. The area by the visitor center and the Museum of the American Sailor was full of newly graduated recruits and their families. At the Museum we attended a presentation on the USS Cole, its history and the attack by terrorists in the Gulf of Aden. It was especially interesting because the presenter had been an Electronics Warrant Officer on the Cole when the ship was attacked and was able to share her personal story. The Museum of the American Sailor focused primarily on the Recruit school and, while limited, was quite interesting. On Saturday we rode the train into downtown Chicago. We took our bikes on the train (you are allowed two bikes in each car) and they made getting around town much easier than walking or taking public transportation. Our first stop was the Shedd Aquarium but we found it to be too expensive and just wandered around the outside. While doing this we saw several art pieces made from plastic that had been salvaged from the ocean. Discarded water bottles, coolers, various plastic containers and more had been used to make these plastic sea creatures. When you see these pictures you will understand why I really, really don’t like it when people use disposable water bottles. I encourage everyone to buy a good water bottle and refill it from the tap. I took advantage of the mobility of our bikes to pick up several geocaches in the area. it’s a great way to learn some unique things about an area. We rode back to State Street for the Chicago Memorial Day Parade. We didn’t plan for it, but we ended up right across the street from the Reviewing Stand with all the dignitaries, including Mayor Rahm Emanuel. I was amazed how many Chicago Schools offer Junior ROTC, there was one school after another in the parade! After the parade we rode to Navy Pier for lunch. We ate at Giordano’s and had authentic Chicago deep dish pizza, a real treat! While we were waiting to be seated and after lunch we explored Navy Pier and took a ride on the Centennial Wheel, which opened in 2016. What a great view! Daniel Burnham, famous architect of the World’s Fair, originally envisioned five piers in his “Master Plan of Chicago,” but Navy Pier was the only one built. The pier was originally built in 1909 and opened for use in 1916 as the Municipal Pier. 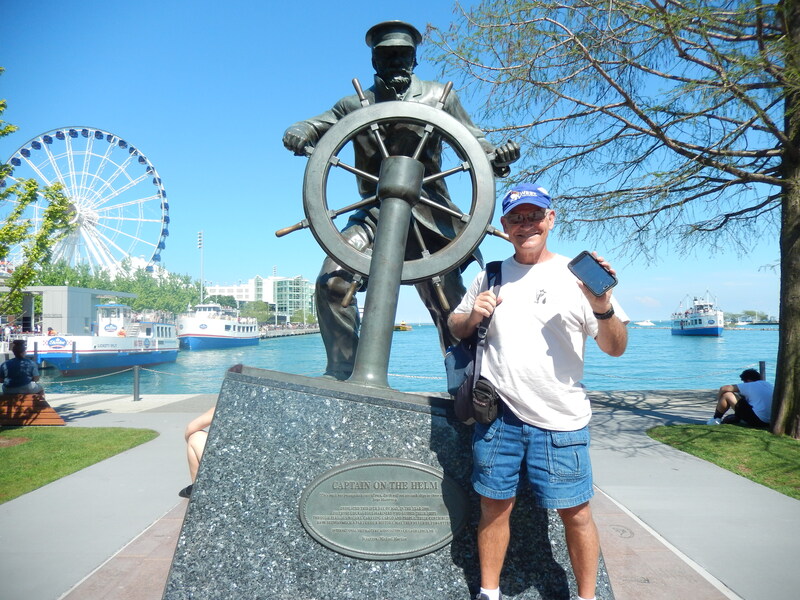 It was renamed the Navy Pier in 1927 to honor those who served in the Navy in WWI. During WWII Navy Pier was used to train pilots for service on aircraft carriers. In fact, former President George H.W. Bush trained at the Navy Pier before deploying to the South Pacific. On base at Great Lakes Naval Station they raise the flag every morning at 8:00. At that time we would hear the bugle call “Attention,” followed by the National Anthem. Tradition is that if you are outside when this happens you face the direction of the base headquarters, stand at the position of Attention and salute during the Anthem. Pat and I were often interrupted in our morning walks by this, but what a way to start your day! 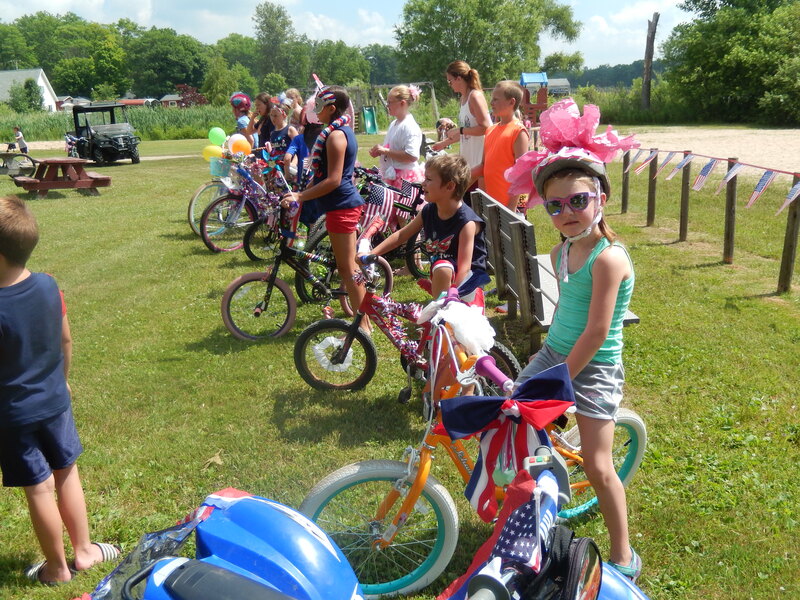 On the morning of Memorial Day we rode our bikes on the Robert McClory Bike Path to the small town of Lake Forest for their Memorial Day Ceremony. It reminded us of when we lived in the small town of DeWitt back in Michigan – small town Americana! The short parade was led by the American Legion Honor Guard, followed by the high school marching band, and Scout troops. 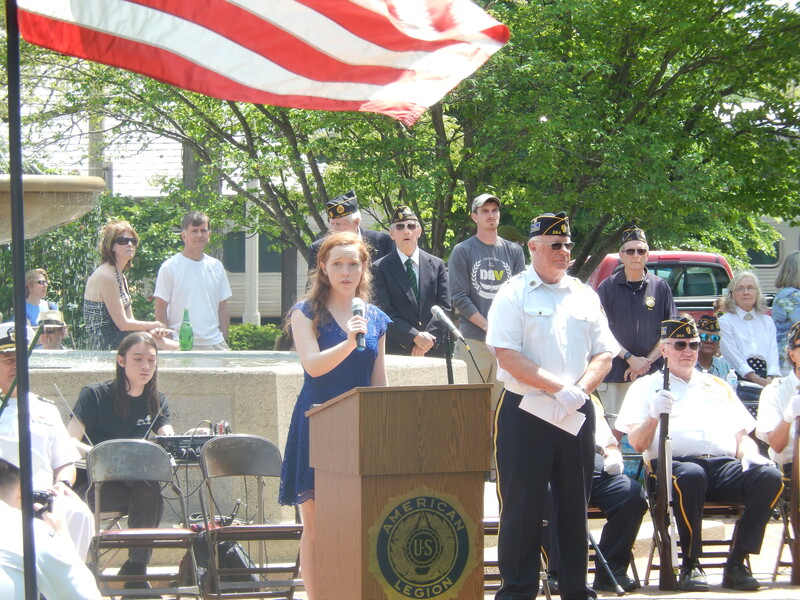 The ceremony was begun with the Star Spangled Banner, sung by a delightful young singer who did a marvelous job. One of the senior navy officers from Great Lakes told of a WWII veteran that he had gotten to know well and his stories. The Scouts completed the ceremony be raising the Flag from half-mast to full. It was a simple, but moving ceremony and we were happy that we were able to share in it. On Tuesday we departed to return to Michigan for the summer. 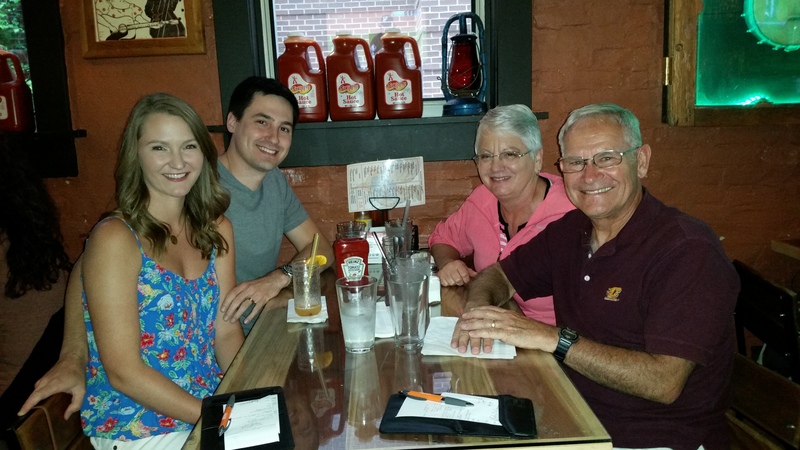 From St. Louis we journeyed north, stopping to see our nephew, Steve Smith and his wife, Brooke, in Champaign, IL. Brooke is working on her PhD in Veterinary Medicine and Steve is in sales in the plastics industry. Steve has also become an accomplished woodworker and we saw several examples of his work – very impressive! 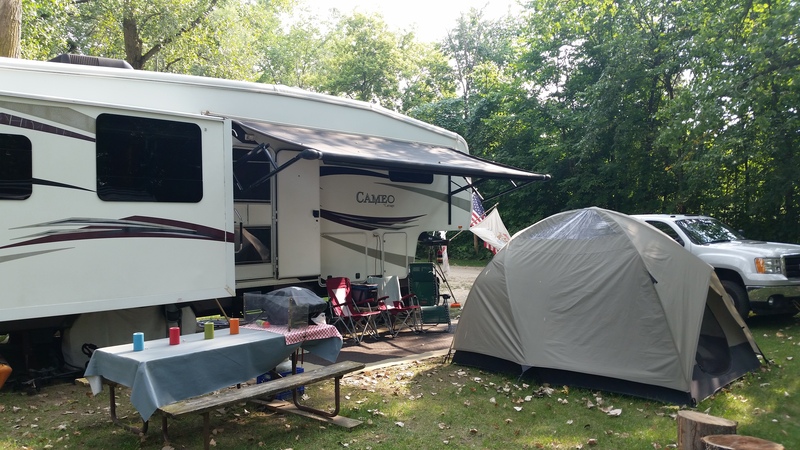 Our destination was Plymouth Rock RV Park in Wisconsin. 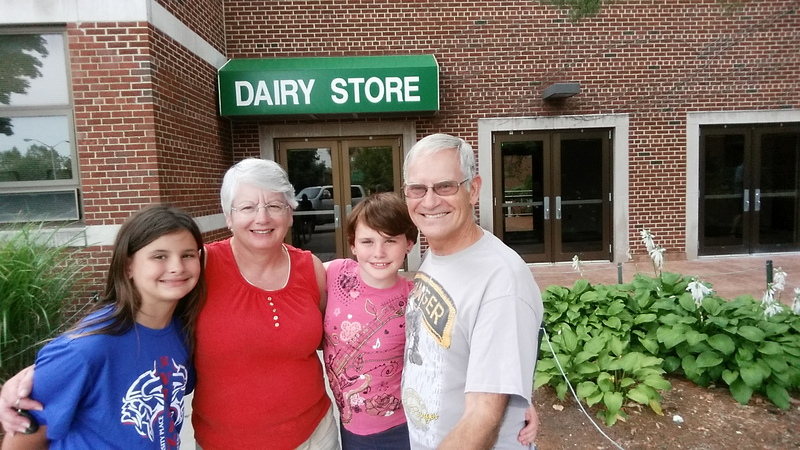 Pat’s sister, Mary Lee and her husband, Welton, have a seasonal site there. 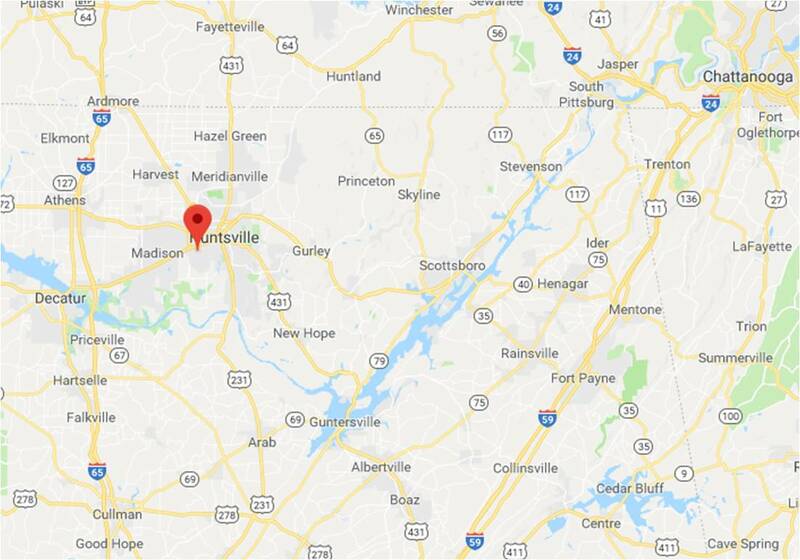 This park has everything from manufactured homes and park model trailers, to travel trailers and tent sites. 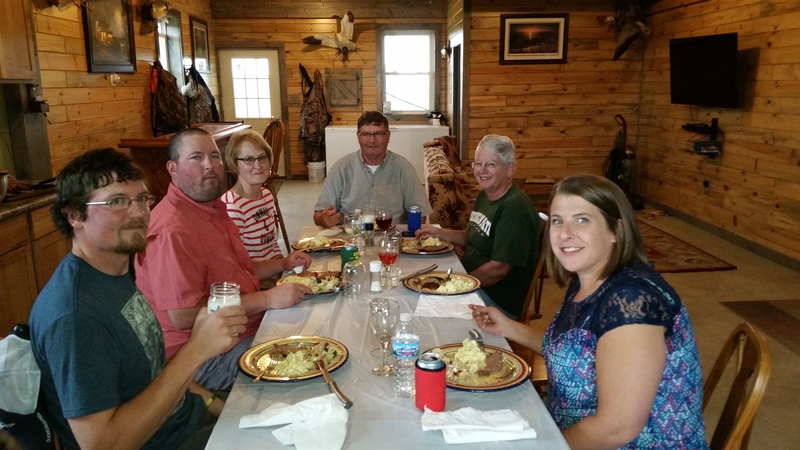 Our real purpose for going to Wisconsin was to see Mary Lee and Welton’s remodeled kitchen. After a couple of days at Plymouth Rock, we drove down to Milwaukee to check it out. 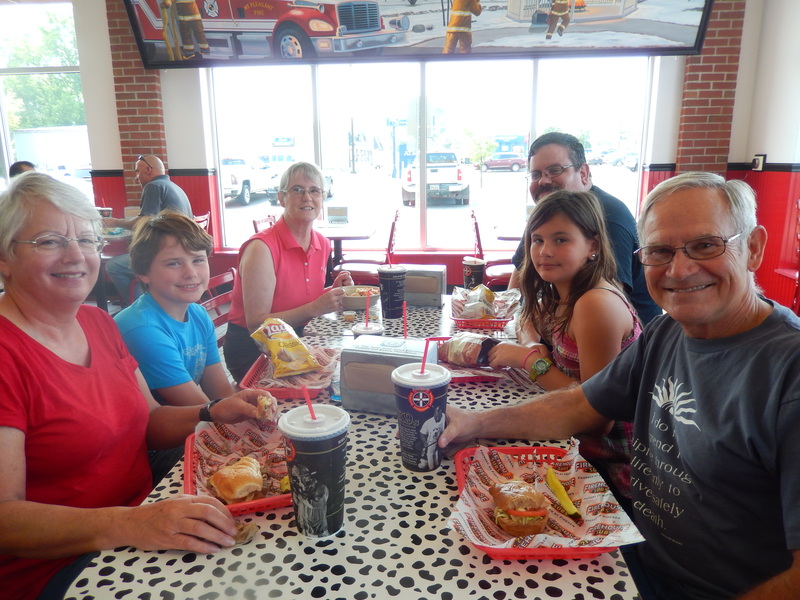 While we were there we spent some time with their daughter, Ashley, and had dinner at a popular pizza place. Good times and good company, how could we go wrong? Well, I never got any pictures, that’s what could go wrong. When returned to Plymouth Rock, we made plans to drive to nearby Manitowoc to see the Wisconsin Maritime Museum. When we arrived we were surprised to see so much of the exhibit devoted to submarines. 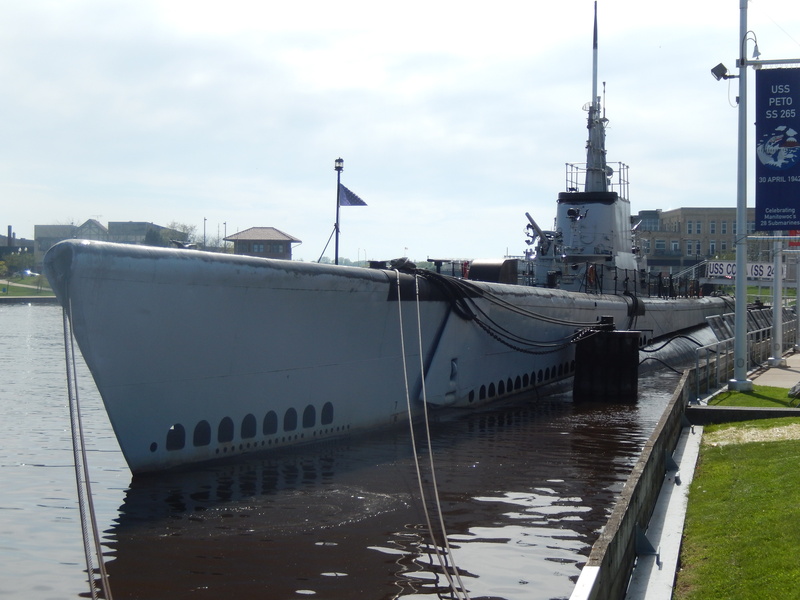 That was when we discovered that the Manitowoc Shipbuilding Company had built 28 fleet submarines during WWII. The first of these 28 submarines, the USS Peto was launched into Lake Michigan in 1942. The submarines completed their sea trials in Lake Michigan, then were floated in a special dry dock via the Illinois and Mississippi Rivers to New Orleans. Four Manitowoc submarines, the Golet, Kete, Lagarto, and Robalo are still on “eternal patrol,” having been lost with all hands in the Pacific while on combat patrol. The Museum displays the USS Cobia, which wasn’t built in Manitowoc, but is of the same class as the Manitowoc boats. The Cobia was used by the Milwaukee Naval Reserve as a training vessel, and is now moored in the Manitowoc River. It has been maintained in excellent condition. We were guided through the Cobia by a former submariner. He gave us the best tour I have ever taken of a submarine. 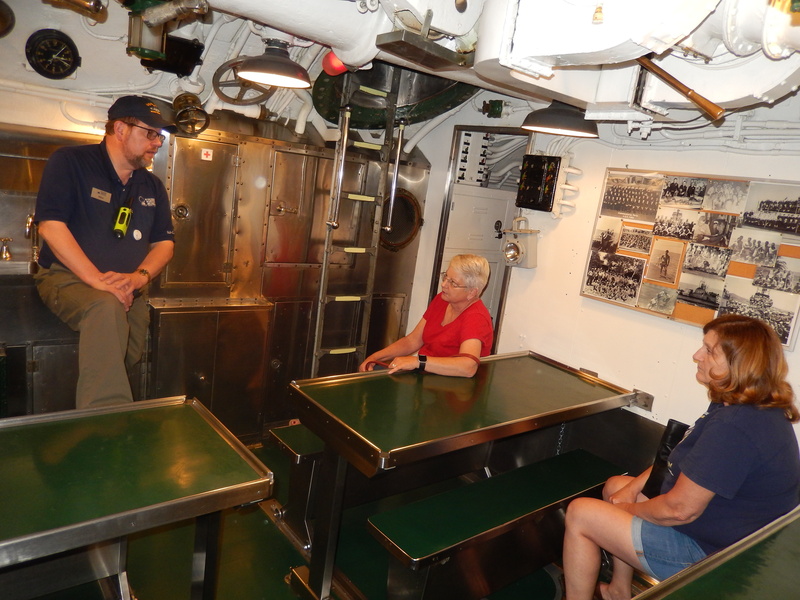 Pat, her sister, Mary Lee, and I started our tour in the forward torpedo room and moved aft (towards the rear). 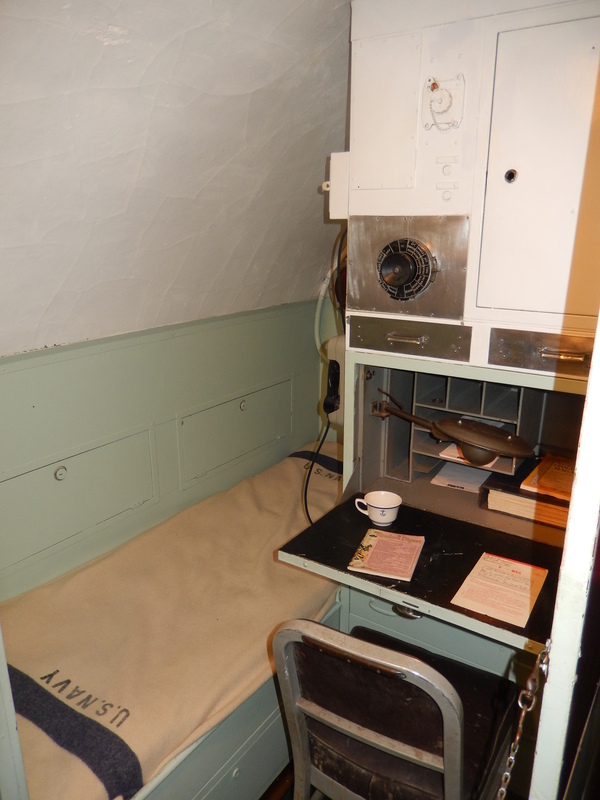 The Captain’s cabin was the roomiest berth in the submarine – I wouldn’t call this roomy. If you were a fan of WWII submarine movies the control room is a familiar site. This is the nerve center of the combat operations and is directly below the conning tower that housed the periscopes. Farther aft was the crew galley where the ship’s company was fed. This space was also used for card games and movies. This picture shows almost the entire seating space. Beyond the galley was the main berthing area for the crew – certainly a lot less space than the commanding officer! Sailors couldn’t hang their clothes, but were creative in keeping their best uniforms pressed. 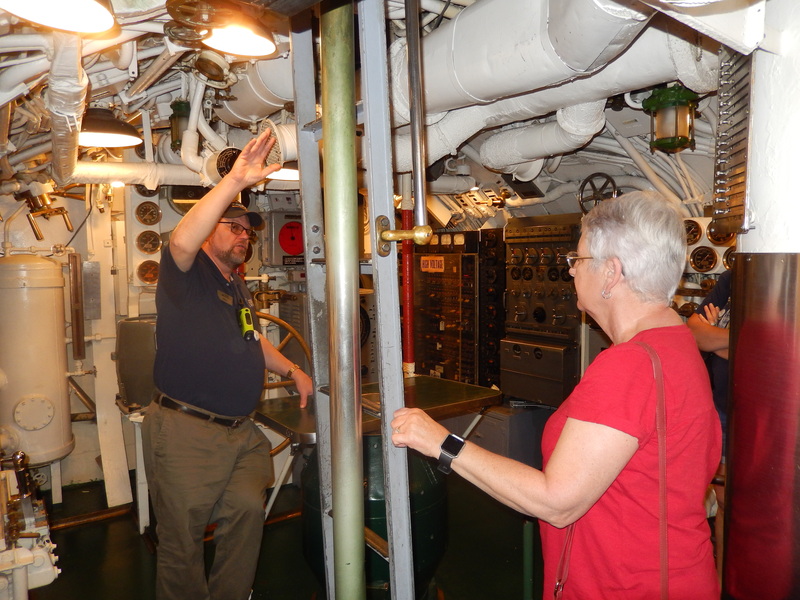 We finished our tour in the Aft Torpedo Room. 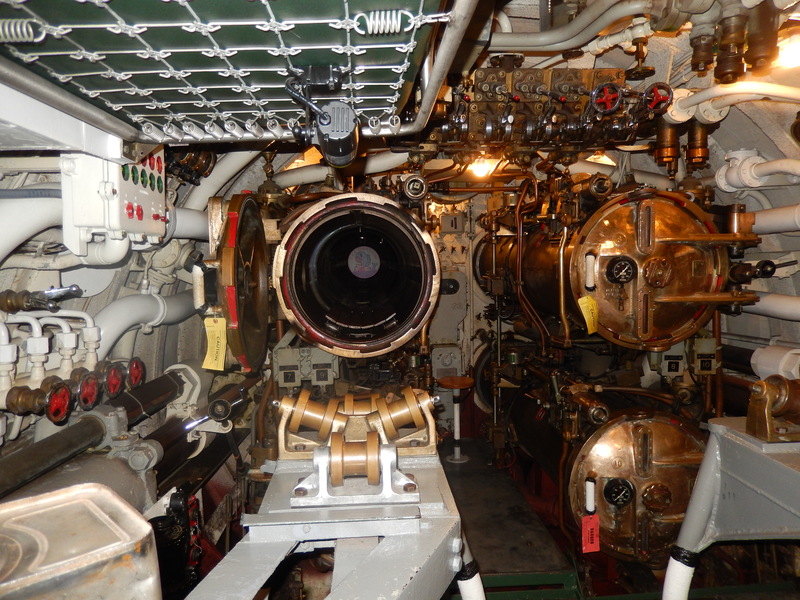 There are six torpedo tubes in the bow and four in the stern. Note that there are bunks directly above the stored torpedoes. In addition to the USS Cobia, there were numerous exhibits on equipment used in discovering and salvaging wrecks, and shipbuilding in the past. 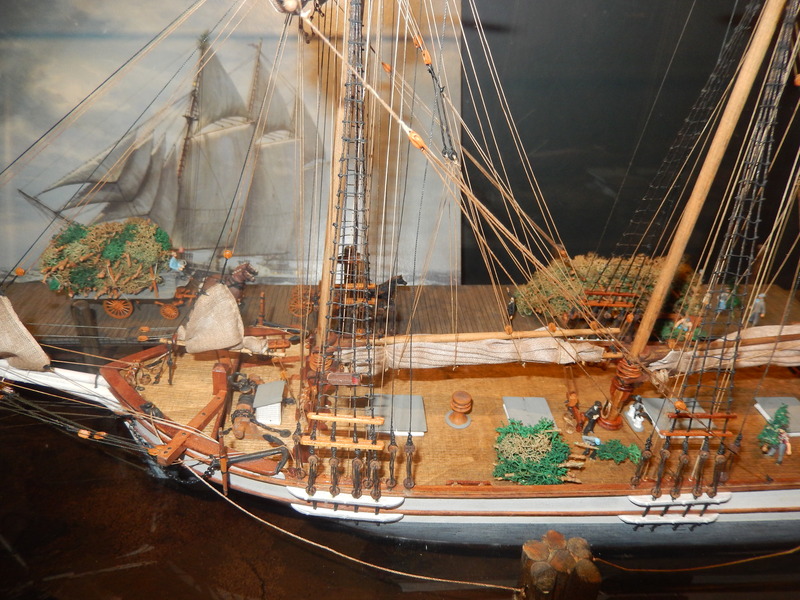 The display of ship models showed the variety of ships that sailed the Great Lakes. The Schuenemann brothers, Herman and August, had been trading Christmas trees in Chicago since around the start of the 20th century. While many rival traders sold to wholesalers and local grocers, Schuenemann sold directly to Chicago residents at dockside by Clark Street Bridge. By cutting out the middleman in this way the trees could be sold cheaply while still making a profit. The venture used the slogan “Christmas Tree Ship: My Prices are the Lowest”, with electric Christmas lights and a tree atop the main mast. The trees were sold for between 50 cents and $1. Schuenemann’s profits from selling Christmas trees never made the family wealthy, but his reputation for generosity was well established, and he delighted in presenting free trees to many of the city’s needy residents. 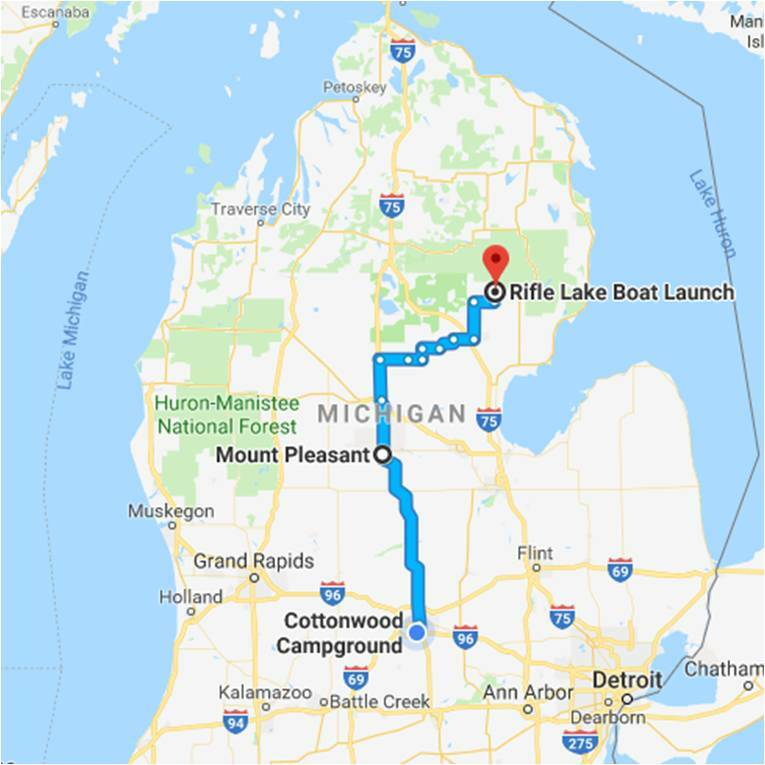 In November of 1912, Schuenemann loaded the schooner with 5,500 trees from Thompson Harbor near Manistique, Michigan and planned to make the week-long journey to Chicago. With trees crammed into every possible corner of the ship. The weight of the trees was far above recommendations. When the Kewaunee Life Saving Station spotted the Rouse Simmons on November 23rd, it was low in the water with tattered sails, flying its flag at half mast to signal that it was in distress. George E. Sogge of the Two Rivers Lifesaving Station, located just south of Kewaunee, sent out the power boat Tuscarora on a rescue mission, but the Simmons was never seen again. 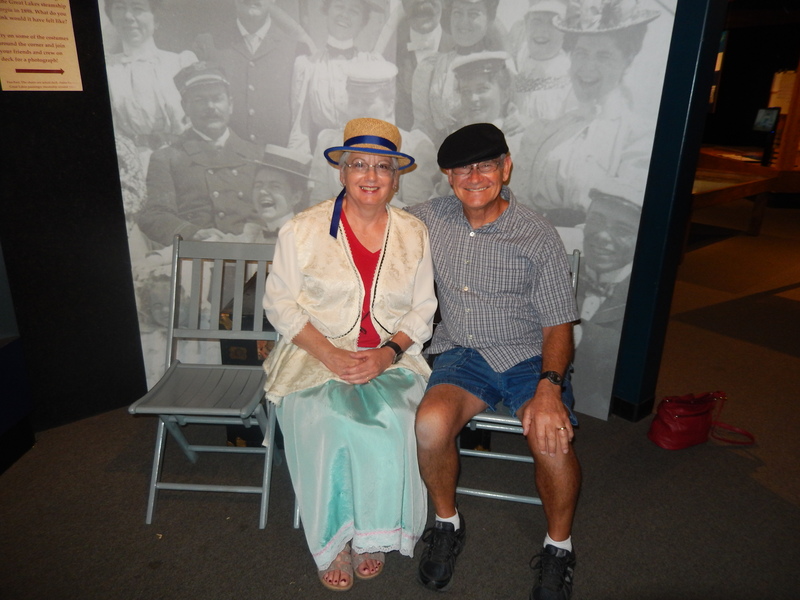 One of the displays gave us the opportunity to dress up in period clothing for a picture on the deck of a Great Lakes steamer. Unfortunately the exhibit was intended for children, while Pat was able to find clothes that fit, the only thing that would fit me was a hat. On Thursday, May 24th, we headed south to the Great Lakes Naval Station, just north of Chicago.